A year has passed and you are probably wondering – well, what happened? We left you on a cliffhanger with the application for our permis handed in just before Christmas! As is the way in life, unexpected events intervened and whoosh – here we are again in the festive season and we’ve barely had time to stop and think, let alone update the blog. Yet this year things feel very different. We did get our planning permission and in record time – it arrived hand-delivered by our Mayor on Boxing Day. He had been to the DDE offices while in St Astier and chivvied them along to stamp our permis de construire. So we feel pretty confident that we have the support of local officialdom. As we live in a rural area where the Mairie is too small to handle planning applications, the end decision lay with the DDE (planning authority). A good relationship with your Mayor is still important as he or she can decide not to approve of a project, which can be overruled but only after an appeal. If you are looking for more tips on planning and renovation, take a look at this article that my partner Hannah wrote for Living France. Luckily the builder in our ‘commune’ (parish), Monsieur Farges, has a good reputation and has done a lot of work locally, so it was easy to see that he and his crew knew what they were doing. If you ever do your own renovation, do ask builders if you can see work they have done previously – any good builder should have no problem with this. We also chose M. Farges because he has a team of four builders and a Manitou hydraulic lift, which meant they could do the job much quicker than us. 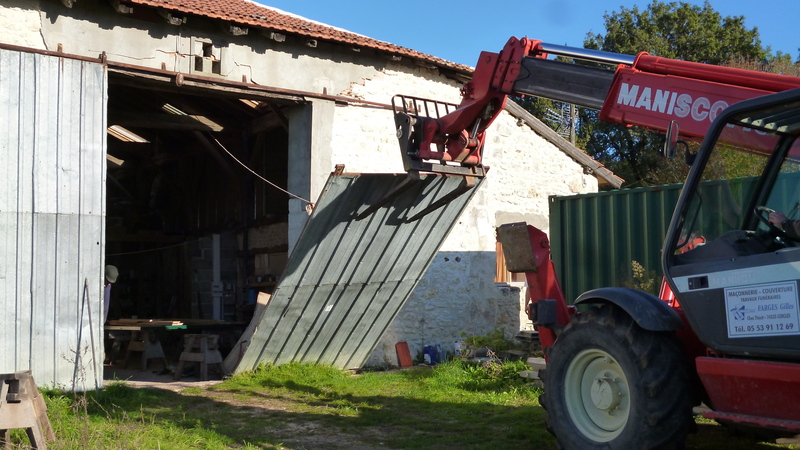 The Manitou came in very handy for removing the enormous five-metre high steel ‘portail’ put on by the last farmer who used The Barn. 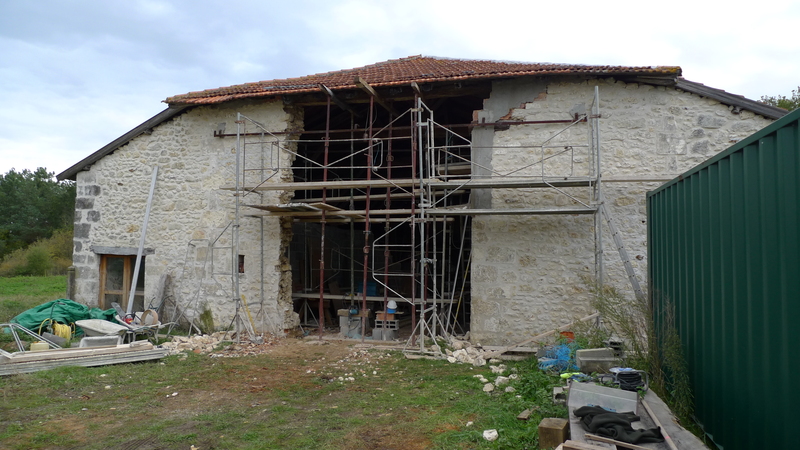 Farges’ team were due to start in October and although this morphed into November, as soon as they arrived they cracked on with the work at a lightning pace, demolishing the ugly concrete and brickwork and propping up the roof with ‘étais’ (acro-props). Once this was done they rebuilt the left side of the door opening in limestone blocks and then placed the five-metre oak lintel, sourced from the local sawmill where we buy our timber framing supplies. Above that, two new stone window surrounds were put in, with stone lintels on the outside and oak on the inside. The whole was finished off with a set of new sliding doors. To make these, I ordered a steel frame from a local metal-working firm, with struts to attach the oak planks to and three frames on each door to hold glass inserts. 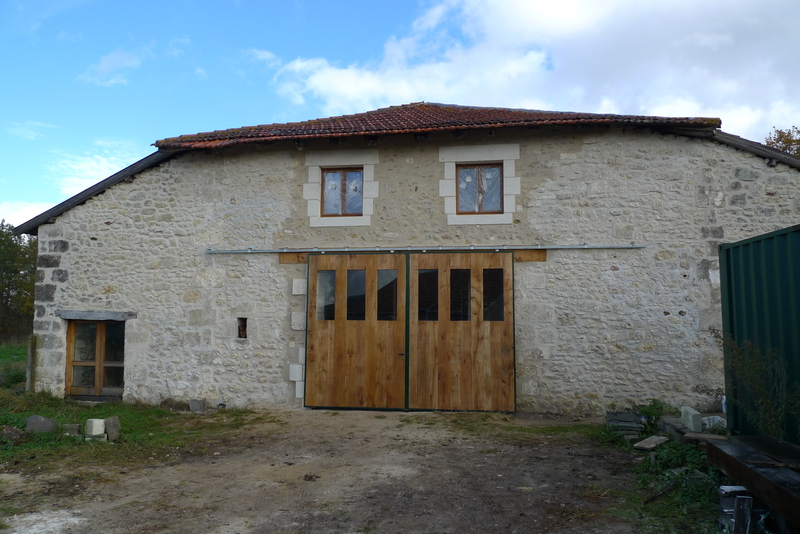 Here is the finished Barn front – a complete transformation from two weeks earlier. We feel that a leap in progress has at last been made and I look forward to the next stage, which is to start building the first floor inside the Barn. This will be a free-standing oak-framed structure, so it will not depend on the Barn walls for support. This is a good insurance policy against putting too much pressure on the existing walls, which were originally built to support part of the weight of the roof. I was not idle over the winter months last year and built first a mezzanine and then this oak gallery. They are now linked by a bridge and will eventually connect up with the first floor. 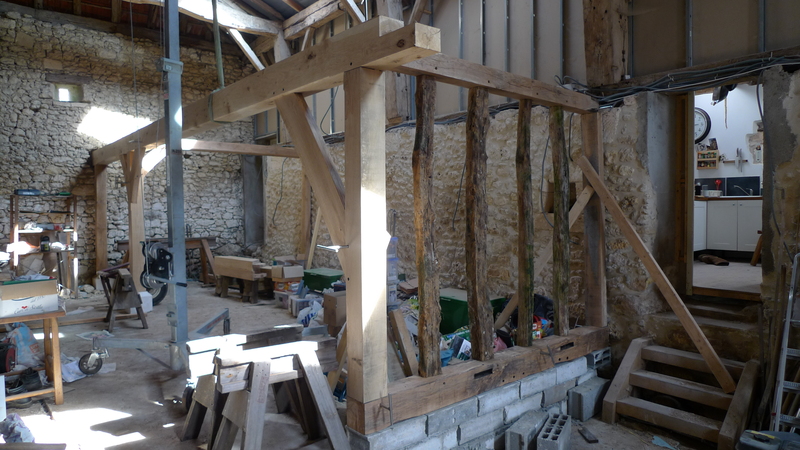 Note the use of recycled rafters for studs in the ‘colombage’ wall, salvaged from the roof repair last autumn. I am champing at the bit to start building the free-standing oak frame that the first floor will sit on but first there is some preparatory work to be done. 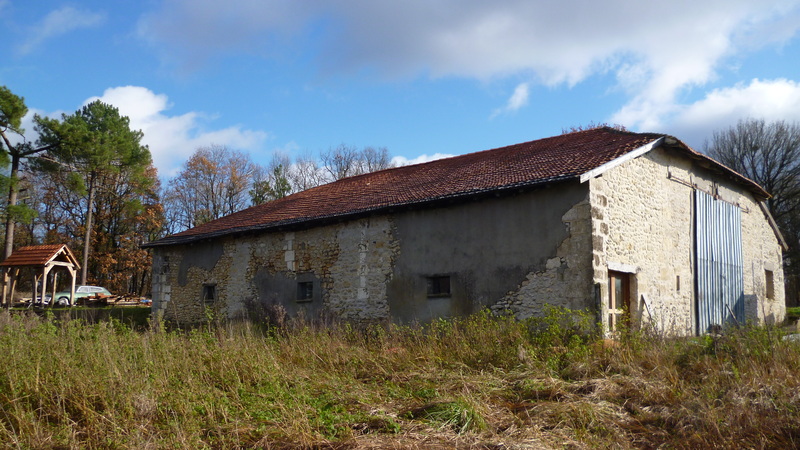 We will ask Monsieur Farges back in the spring to lay a concrete slab outside the west-facing wall of The Barn. So we are ending our first whole year at The Barn with a sense of achievement but with a huge project still ahead of us. We wish you all the best with your own projects in 2013! Stormy weather hit us in December. Although the worst of it was on the west coast, we were still badly hit in Dordogne, with 70 mile an hour winds and lashing rainstorms. Memories of the storm that devastated France in 1999 are still fresh around here, so anything out of the ordinary is nerve-wracking for those who remember it. People still talk about ‘La Tempête’ as though it happened last year. 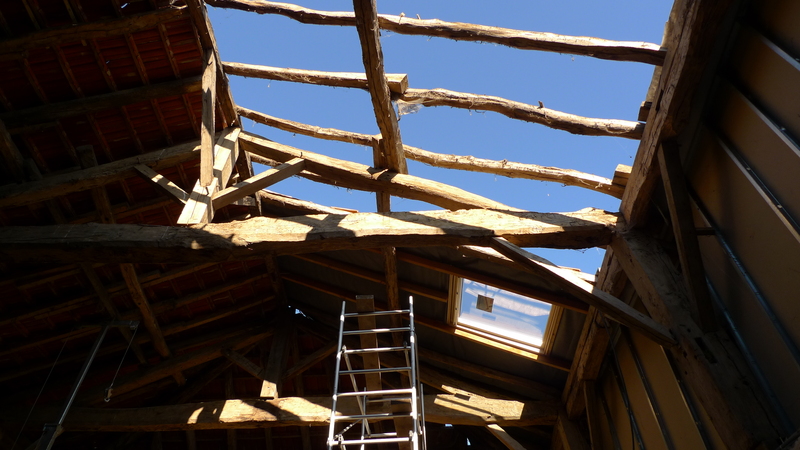 After surviving for several hundred years, the roof structure in The Barn shifted in 1999 and a number of the wooden trusses pulled apart. This resulted in half of the roof being stretched and the other half compressed. Although this is not a big problem, the side of the roof that got stretched was leaking over our bedroom and badly in need of repair. Luckily we managed to get that half of the roof done in October. Many of the original rafters had to be replaced with Douglas fir as they were simply too bowed to hold the tiles flat, but we plan to use them to build interior ‘colombage’ (half-timbered) walls. While mending the roof we put in several Velux windows, which meant handing in a ‘déclaration préalable de travaux’ (a declaration of works) at the Mairie. In principle, anything that will change the external appearance of a property requires a ‘déclaration’. 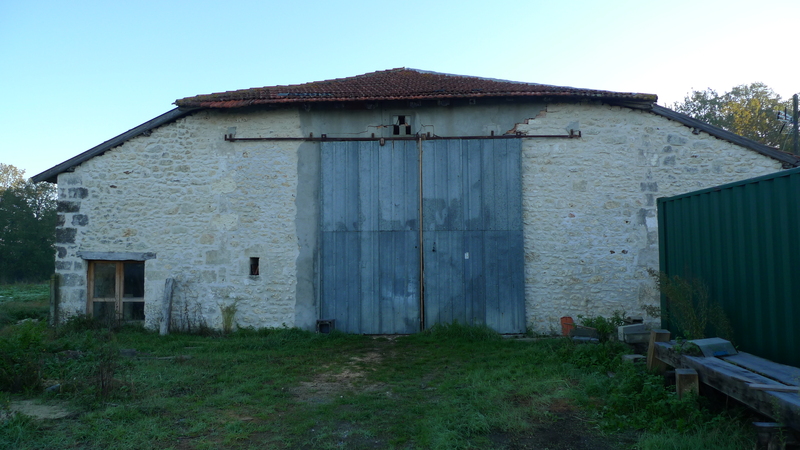 We had to do this because our ‘permis de construire’ (planning permission), which the previous owner obtained for The Barn, had run out. The ‘permis’ is handed out to proprietors rather than properties in France and runs out if work is not started within two years. We also wanted to change the plans from the previous designs. With just one of these changes, we might have got away with a ‘modification’, but not with all three. At 340 square metres, The Barn is double the maximum size you can submit for planning without using an architect, by law. The many small new houses you see in France are designed at just under 170 square metres in order to save on the cost of an architect. After waiting months to hear from a local architect (who did the original plans), he sent us a very expensive quote. So we were back to the drawing board, literally. Eventually, by word of mouth (‘de bouche à oreille’), we found a fantastic architect called Olivier Brunner. He did our drawings and permis application for less than half the earlier quote. If you are planning a similar project, we would recommend shopping around before committing to an architect. 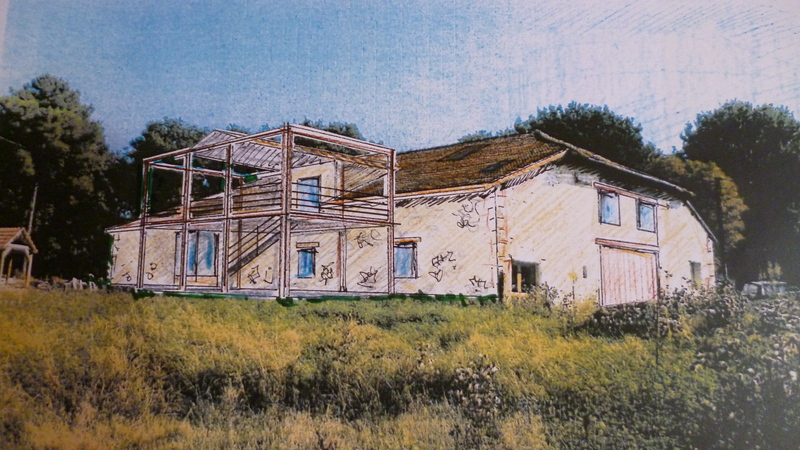 Here you can see the architect’s drawing of the rear of the barn, including the large oak framed terrace that will overlook the view. Although there are hoops to jump through, both buying land to build on and getting planning permission are still much easier than in the UK. Even with the relatively low value of the pound, building plots in France still represent very good value for money and are readily available. However, the situation is gradually changing as land is needed for agriculture and development of rural areas cannot continue forever. Already, before any land is sold, the ‘SAFER’ (rural and land development societies) can decide it should be agricultural land and offer local farmers the chance to buy it first. This happened in the case of The Barn and it took a couple of months before the all clear came through. When looking for land or a renovation project, you also need to watch out for ‘monuments historiques’. 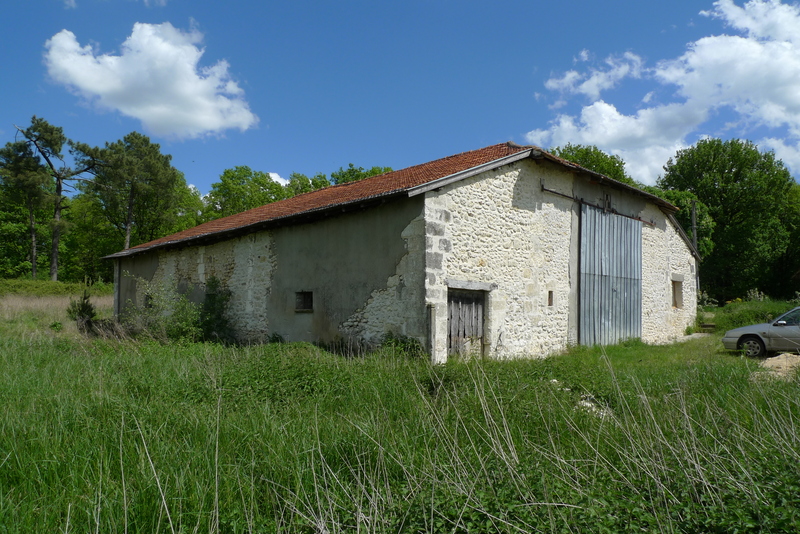 If your plot or building is within 500 metres of one, any works will have to be passed by the ‘Bâtiments de France’ – the guardians of France’s architectural heritage – as well as the DDE (planning authorities). At La Rambaudie we are not worried about this as our neighbour lives in a hybrid construction of part mobile home and part breeze-block, all sheltered under a big Dutch barn. So we are optimistic that the large oak framed terrace on the back of The Barn will be passed by the DDE. On the Saturday before Christmas, we finally took our ‘demande de permis de construire’ to the Mairie in Cercles. It felt like a huge achievement, but of course it is only really the beginning, as we still have a huge conversion project to do. ‘L’Ancienne Grange’ or ‘The Barn’ as we imaginatively call it, is a very old oak framed barn in the Riberac area of northern Dordogne. As you can see, it’s still very much in its ‘barn’ phase at the moment, and needs a lot of adaptation before it becomes a workshop and living space for myself and my partner Hannah. Two local architects who specialise in old buildings (one works for Bâtiments de France) visited us a little while ago and their best guess as to the date it was built (based on the style of the corner stones – the ‘coins’) is anywhere between early 17th and early 18th Century. It’s huge – 340 m2! We can already live in one part of it, which was converted before we bought it (spot the difference in the slideshow below). As you can see, there’s a massive amount of work to do on the rest! The Barn got planning permission in 2002 but this has expired so we need to start anew, which is also a chance to review the designs. The local architects both specialise in traditional architecture, so they were very enthusiastic about a barn that has kept its character more or less intact after several centuries. We’re keen to keep its character too – for example, we’ll use ‘colombage‘ (lath and plaster walls with timber frames) for the interior walls. However, as you can see from the pictures below, we need light in there, so some large openings are going to be essential. My plan is to have French windows leading onto a large green oak terrace on the first floor, overlooking the hills to the north-west. This would give us a space outdoors that gets the sun almost all year round – and a shelter (underneath) which I could use as a fair weather workshop. Whether the DDE (the French planning authority) will go for that remains to be seen!